As central banks have been testing the limits of unconventional monetary policies, many observers have started to consider more radical options. One that has been gaining ground is that of ‘helicopter money’ (Friedman 1969) or, more soberly described, ‘overt money finance’ of government deficits (Turner 2015). Proponents see it as a sure-fire way to boost nominal spending by harnessing central banks’ most primitive power: their unique ability to create non-interest bearing money at will and at negligible costs. But does this really represent an additional tool for monetary policy or is it simply a reformulation of what central banks have done so far, albeit with greater fanfare? There is broad agreement that helicopter money is best regarded as an increase in economic agents’ nominal purchasing power in the form of a permanent addition to their money balances. Functionally, this is equivalent to an increase in the government deficit financed by a corresponding permanent increase in non-interest bearing central bank liabilities. Thus, on the financing side, the main difference with central bank asset purchases financed by issuing non-interest bearing bank reserves practised in the past, notably by the Bank of Japan during the early to mid-2000s, is that it is intended and perceived to be a permanent rather than a reversible operation (e.g. Reichlin et al. 2013). The central bank credibly commits never to withdraw the increase in reserves. There is also general agreement that how the nominal expansion will be split between increases in the price level and in output depends on the broader features of the economy, notably how much prices adjust (‘nominal rigidities’). But, regardless of the split, in the models typically used, permanent monetary financing boosts nominal demand more than temporary monetary financing because it relaxes the (consolidated) government sector intertemporal budget constraint (Buiter 2014). Less debt finance means lower interest payments, forever. Even if the government issued debt, if this was purchased by the central bank which, in turn, issued non-interest bearing bank reserves, the consolidated government sector would incur a lower interest debt service burden. All else equal, this saving would boost nominal demand, as there would be no need to raise additional taxes. But this argument misses a crucial trade-off. Given the intrinsic features of how interest rates are determined in the market for bank reserves (bank deposits at the central bank), the central bank faces a catch-22. Either helicopter money results in interest rates permanently at zero – an unpalatable outcome to most, including those that advocate monetary financing1 – or else it is equivalent to either debt or to tax-financed government deficits, in which case it would not yield the desired additional expansionary effects. The reasoning is simple. Banks hold reserves for two main reasons: i) to meet any reserve requirement; and ii) to provide a cushion against uncertainty related to payments flows. The amount of reserves demanded in excess of the reserve requirement is then very interest-inelastic (i.e. in effect, vertical), dictated largely by structural characteristics of the payments system, which effectively do away with end-of-day settlement uncertainty.2 In monetary frameworks focused on setting targets for a short-term interest rate, what is critical for achieving these targets is how excess reserves – i.e. holdings over and above any minimum requirements – are remunerated. This is what determines the overnight rate. There are two types of remuneration schemes. In one type, excess reserves are remunerated at a rate below the policy rate (Figure 1, left-hand panel) – the most common scheme. In this case, achieving the desired interest rate target requires that the central bank fine-tunes the amount of reserves to meet the interest-insensitive demand (R̄), which is typically a small, frictional amount. Failure to do so would generate significant volatility in the overnight interest rate. Any excess would drive it to the floor set by the remuneration on excess reserves (zero or the rate on any standing deposit facility), as banks seek to get rid of unwanted balances by lending in the overnight interbank market. Any shortfall would lead to potential settlement difficulties, driving the rate to unacceptably high levels or to the ceiling set by end-of-day lending facilities. The Reserve Bank of Australia, for example, operates such a scheme, with no reserve requirement. Note the small and stable amount of excess reserves, spikes aside (right-hand panel of Figure 1). The central bank then sets the rate wherever it wishes, by signalling and/or operating at that rate. 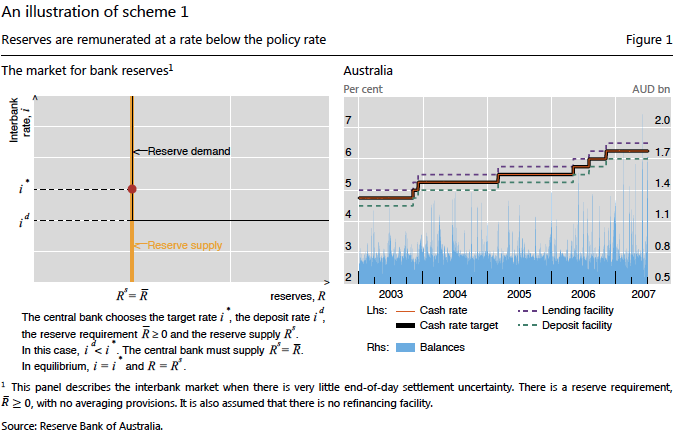 In the alternative scheme, the central bank remunerates excess reserves at the policy rate – typically the deposit facility rate (Figure 2, left-hand panel). It then supplies more balances than necessary for settlement purposes so as to operate on the horizontal portion of the demand for bank reserves. This sets banks’ opportunity cost of holding reserves to zero, as they become a very close substitute for other short-term liquid assets. The central bank can then supply as much as it likes at that rate. 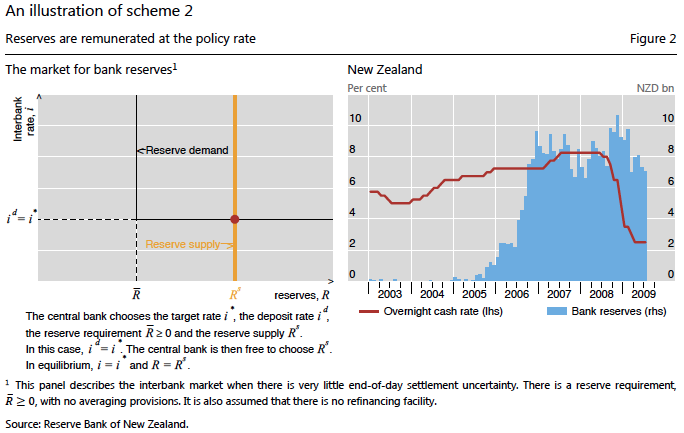 The Reserve Bank of New Zealand represents a good example, having moved in 2006 to such a framework (right-hand panel of Figure 2), after having hitherto operated as in scheme 1. Many major central banks, including the Federal Reserve and the Bank of England, have been operating under such a scheme post-crisis. In either case, interest rates can be set quite independently of the amount of reserves in the system. A given quantity of reserves is consistent with many different levels of interest rates; conversely, the same interest rate obtains with different amounts of reserves. The ‘decoupling’ of interest rates from reserves is obviously well known to central banks but, surprisingly, it has not yet found its way into textbooks and economic thinking more generally. It is discussed in detail in Borio and Disyatat 2010, Disyatat 2008, Borio 1997 and Keister et al. 2008. This seemingly innocuous technical detail has major implications. The central bank can of course implement a permanent injection of non-interest bearing reserves and accept a zero interest rate forever (scheme 1). This produces the envisaged budgetary savings but at the cost of giving up completely on monetary policy. If the central bank wishes to avoid that outcome, it has only two options.3 It can pay interest on reserves at the policy rate (scheme 2), but then this is equivalent to debt-financing from the perspective of the consolidated public sector balance sheet – there are no interest savings.4 Or else the central bank can impose a non-interest bearing compulsory reserve requirement equivalent to the amount of the monetary expansion (so that excess reserves remain unchanged – scheme 1), but then this is equivalent to tax-financing – someone in the private sector must bear the cost.5 Either way, the additional boost to demand relative to temporary monetary financing will not materialise. The models fail to bring this crucial point out because they omit a realistic determination of the nominal interest rate. Typically, they neglect bank reserves altogether on the presumption that there exists a traditional money demand function that relates interest rates to the money supply (cash), the price level and income. For a given level of the interest rate, this relationship dictates that an exogenous rise in the money supply will lead to a proportionate increase in nominal income (with flexible prices, just in the price level). In fact, such models often imply that monetary financing will increase nominal interest rates (Galí 2014). As we have made clear, in the market for bank reserves where interest rates are actually determined, there is no such thing as a well-behaved downward-sloping money demand function. Unless interest is paid on excess reserves, the central bank must supply the specific amount of reserves banks demand – no more and no less. Moreover, cash does not influence the setting of the interest rate. In real life, central banks meet entirely passively the public’s demand for cash (e.g. Grenville 2013). If they did not, either the amount in excess of desired balances would be converted into bank deposits and then switched by banks into excess reserves, or it would fall short of the demand, frustrating the public, which would presumably turn to alternative means of payment. Helicopter money, as typically envisioned, comes with a heavy price: it means giving up on monetary policy forever. Once the models are complemented with a realistic interest-rate setting mechanism, a money-financed fiscal programme becomes more expansionary than a debt-financed programme only if the central banks credibly commits to setting policy at zero once and for all. Short of this, these models would suggest a rather limited additional expansionary impact of monetary financing. If something looks too good to be true, it is. There is no such thing as a free lunch. Authors’ note: The views expressed are those of the authors and do not necessarily represent those of the Bank for International Settlements or the Bank of Thailand​. Borio, C (1997), “The implementation of monetary policy in industrial countries: a survey”, BIS Economic Papers, no 47. Borio, C and P Disyatat (2010), “Unconventional monetary policies: an appraisal”, The Manchester School, 78(s1), pp 53–89, September. Also available as BIS Working Papers, no 292, November 2009. Bernanke, B (2016), “What tools does the Fed have left? Part 3: Helicopter money”, Ben Bernanke’s Blog, Brookings Institute, April 11. Buiter, W (2014), “The simple analytics of helicopter money: Why it works – always”; Economics, vol 8, 2014-28, August. Derviş, K (2016), “Time for helicopter money?”, Project Syndicate, 3 March. Disyatat, P (2008), “Monetary policy implementation: misconceptions and their consequences”, BIS Working Papers, no 269. Friedman, M (1969), “The optimum quantity of money”, in Milton Friedman, The Optimum Quantity of Money and Other Essays, Chapter 1. Adline Publishing Company: Chicago. Galí, J (2014), “The effects of a money-financed fiscal stimulus”, CEPR Discussion Paper 10165. Grenville, S (2013), “Helicopter money”, VoxEU, 24 February. Keister, T, A Martin and J McAndrews (2008), "Divorcing money from monetary policy," Economic Policy Review, Federal Reserve Bank of New York, September, pp 41-56. Reichlin, L, A Turner and M Woodford (2013), “Helicopter money as a policy option”, VoxEU, 20 May. Turner, A (2015), “The Case for Monetary Finance – An Essentially Political Issue”, paper presented at Sixteenth Jacques Polak Annual Research Conference, International Monetary Fund. Turner (2015) sees overt monetary financing as a way of avoiding the unwelcome consequences of low interest rates, such as excessive risk-taking and increased debt. Derviş (2016) also advocates helicopter money partly as a way to avoid the negative consequences of maintaining low interest rates for too long. For simplicity, here we avoid the complications that arise when reserve requirements have averaging provisions, which do not really affect our argument. For the details, see Borio (1997). Conceptually, it is possible that the demand for reserves grows over time until at some point excess reserves are eliminated. In practice, this would take an exceedingly long time. The most probable case is when banks are subject to a reserve requirement fixed as a proportion of outstanding deposits. As the latter grow, demand for reserves to fulfil the requirement increases. But this is a very gradual process. Of course, there is a maturity dimension too. This would be equivalent to financing at the overnight rate, as opposed to a longer-term rate. More elaborate schemes involving remunerating reserves but recouping the cost through a separate levy on banks (Bernanke 2016) amount to the same thing: tax-financed deficit spending.